Tonights episode of American Horror Story: Coven - the second so far this season paid off substantially in the Fleetwood Mac dept. As reported, eight songs are to be used this season and tonight the show kicked off with Stevie's "Edge of Seventeen" during a fairly gruesome scene where Misty Day brings a couple of gators back to life and they mangle two poachers. Misty later on professes her love of Stevie Nicks to Zoe all the while Fleetwood Mac's "Rhiannon" is playing in the background telling Zoe about the song saying "this was her anthem" and that Stevie is the "white witch" and her hero... The show is a hoot, it's all pretty camp, sometimes gross, but cool, fun and especially fun to watch the actors like Jessica Lange, Angela Bassett and Kathy Bates. As a result, both Stevie, Fleetwood Mac and Edge of Seventeen were trending on Twitter in the USA for a short while tonight. After being burned alive in last week’s premiere of American Horror Story, Misty Day returned tonight as the hippie witch with the power to bring back the dead. She also excels at keeping her neighboring alligators fed. But what she really loves is Stevie Nicks. (I think we all died a little when young Zoe asked if Stevie was the winner of American Idol, yes?) With FrankenKyle left in the care of mystical Misty, one can only wonder: Will he dig “Rhiannon” as much as Misty? 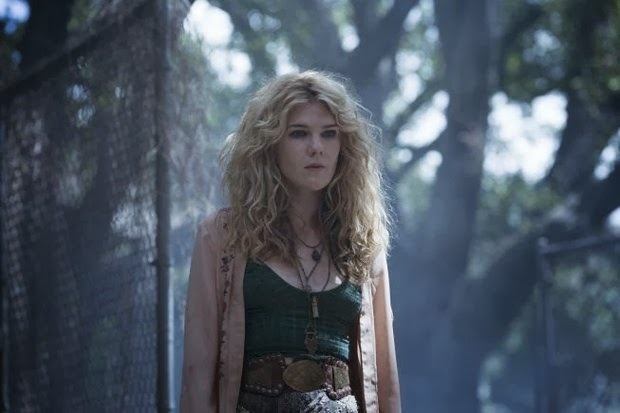 Vulture spoke with the wonderful, if especially spoiler-averse, Lily Rabe about all things Stevie and Misty’s mysterious life in the New Orleans swamp. What did Ryan Murphy tell you about Misty before you started shooting? I knew Misty would be burned at the stake in the first episode and that I’d immediately be back. But the big thing he told me was that she is obsessed with Stevie Nicks. That’s been a major part of figuring her out, post burning. The wardrobe, the hair, it’s all very Stevie-centric. How does one approach playing someone with a Stevie Nicks obsession? Well, I’m pretty obsessed with her, too. It’s been delicious. It’s not that Misty just wants to look like Stevie or listen to her music. She’s quite isolated and lonely, and she has this love affair with Stevie. Stevie is her idol and the lyrics are her mantras that she lives by. She’s looking for someone to help her understand why she is the way she is, so in that way her soul is nourished by Stevie. It’s not a superficial obsession, it’s a deep love. And yes, you will see some shawls. Stevie and Ryan Murphy previously collaborated on Glee. Do you know if she got a heads up about your character? In the past, she hasn’t exactly embraced the rumors that she was into witchcraft. Oh, she and Ryan are absolutely in touch. Actually, when I found out about that I had to pretend I didn’t know about it because I’d get too excited. I wouldn’t be able to function. Someone said something like, “Well, we might change this one thing. We’re e-mailing Stevie now about it.” Uh, excuse me? You’re doing what? I don’t really freak out about many people, but even talking about her right now my cheeks are turning red. She’s a really big deal to me. To everyone. But yeah, Ryan and Stevie are e-mailing, and so she’s very aware of what we’re doing. Yes, there are plenty of things you can read about people having these theories about the witch thing, but I don’t know anything about that. Certainly it was something she was interested in and wrote about in her songs. Have you gotten to speak with her? No, no, no. I might just combust. Do you think we’ll see Misty take flight a la Rhiannon? It would be a witchy cliché, but awesome. I can’t say. It would be awesome. Flying is what I want if I could pick a personal superpower. Why do you think you’re obsessed with Stevie? My older brother is a musician, and he’s 10 years older than me and really cool. When I was little, he would play a lot of Fleetwood Mac and R.E.M. and Aimee Mann and Liz Phair. He taught me very, very well. I became especially obsessed because I started learning the guitar on set of American Horror Story last year, and the first song I asked to learn was “Landslide.” Why am I obsessed? There’s something about Stevie that is kind of supernatural. Please know I’m not saying there’s anything witchy about her, but she is sort of beyond comprehension. She is other-worldly. And for Misty, for a girl in this world who has this thing that is extraordinary, Stevie Nicks is great, because she has that. She really has magical powers in my mind. So you’re into the idea of witches? I love all that stuff. When I found out when we were shooting here in New Orleans, where it’s really at your fingertips, it was very exciting. I’m very open to all of those things. In tonight’s episode, Misty manifests in Zoe’s car. Did they summon her when they brought back Kyle? It’s connected to that. I think they summon her without even knowing. What they’re doing belongs to Misty in a way, so there’s a necessity for Misty to be there. FrankenKyle is left with Misty and from what it looks like, he can no longer speak. Not that I could pick a favorite, but everything I’ve done with Evan Peters is my favorite. On a show like this, you’re never gonna get scenes with everyone, but last season, I would be like, “Hey Ryan, I really love that Evan. I really want to work with him.” He’s a really special actor. I’ve never read or seen anything like the relationship between Misty and Kyle. There are so many things in it. Evan is so brave. How would you characterize their relationship? Does she feel maternal toward him? I wouldn’t say no and I wouldn’t say yes. There’s a lot of colors in that relationship and I would hate to name them because I think it would take something away. The relationship is very fluid and keeps growing. All of a sudden this new thing will come into it. It’s definitely complex. Misty has the power of resurgence, but she also had some sort of control over the alligator that emerged from the swamp and ate that guy. Could she be the next Supreme? She is very, very powerful, more powerful than she understands in the beginning. She has a huge relationship with nature. But she’s not wondering about the Supreme because she’s out in the swamp, so ... look, I know she’s listening to a lot of Stevie. What does she do all day alone in the swamp? Oh, she’s a busy girl. She has quite an elaborate garden. I do think she’s a very creative person based on the way this house that she’s built for herself looks and is maintained. And she has to go shopping somehow to wherever the hell she finds those amazing clothes. The boots are a necessity no matter what she’s doing, because you gotta be in boots if you love Stevie. I haven't checked out the show yet, but now I'm making it a must-see. Fantastic write-up and fantastic interview! It goes without saying that Lily Rabe most likely visits this site and is obsessed about all things Fleetwood Mac as we are. So, go ahead, Lily, HIT IT!! Just watched AHS for the first time and I am hooked! Especially because Lily is just as obsessed with Stevie Nicks and the Mac as I am!